You can now order your DollyCrane SD or SD+ with a new compact length rail! You can now order the DollyCrane SD and DollyCrane SD+ 16kg in a new shorter 1.6m compact rail length. The standard 1.85m rail gives a useable tracking length of 1.6m, so any shorter rail will also result in a shorter tracking distance. The 1.60m compact rail will have an effective tracking distance of approximately 1.35m which enables users to get the DC into a smaller space and with an overall smaller ‘footprint’. Please note: All compact DollyCranes will be built to order so lead times may increase and full payment is required with order. NEW DOLLYCRANE SD+ 16kg is now available for demo! 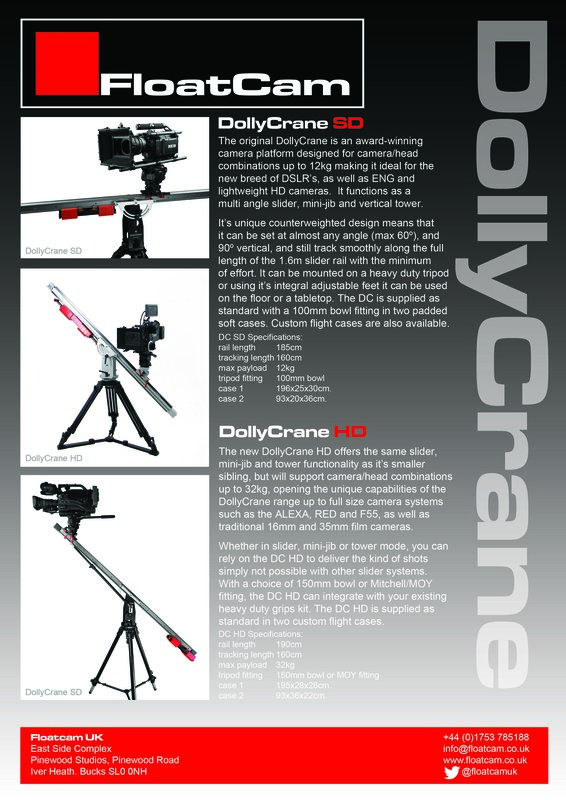 The new DollyCrane SD+ 16kg is available NOW for demo in the UK. We listened to your feedback, spoke to our rental partners and to the engineering geniuses behind the DollyCrane and we are proud to announce the launch of the new DollyCrane SD+! We have a SD+ 16kg (Moy mount) in stock at our Pinewood office for immediate demo and have already secured orders for the new model. With a higher weight capacity of 16kg and a choice of MOY or 150mm bowl fittings, but still with the same form factor and portable build as the standard DollyCrane SD, it is a perfect fit with small form 2K/4K cameras such as the Sony F5/F55, Canon C300/500, BMCC in a usable ‘cine build’ (accessories, follow focuses, on-board monitors, matte boxes etc). 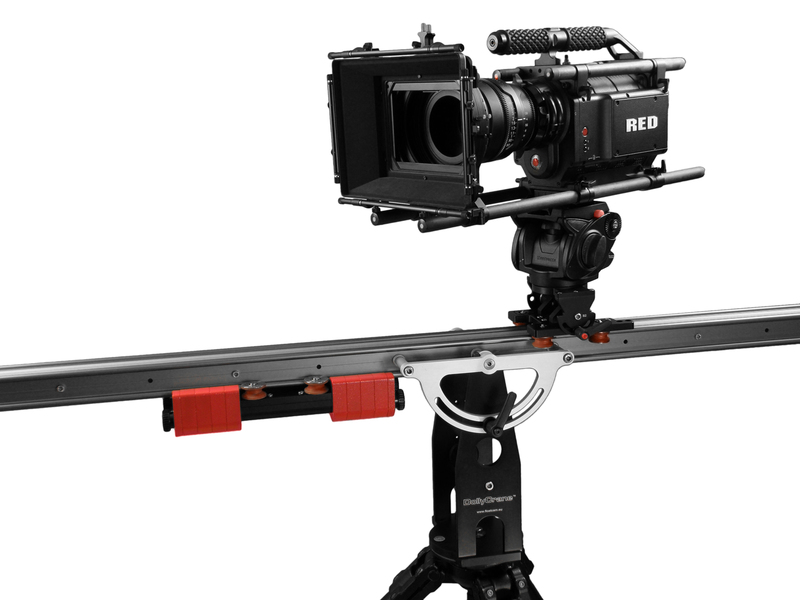 Combined with our custom* or universal bowl head flat base adaptors, engineered in the UK by Ronford Baker, the new SD+ really is the perfect all round camera platform for independent film production. And if you have a standard DollyCrane SD, we can also offer a full upgrade service to bring your kit up to the new SD+ spec. Just ask for prices and details. *Custom head adaptors currently available for the Sachtler Video 20 and O’Connor 1030. Fancy a UK Demo of the DollyCrane? We’re taking post IBC demo bookings now! If you saw the Floatcam DollyCrane and Motion Control at IBC this month, and fancy a closer look in your own premises you can arrange a personal demo with one of our UK team. We are travelling the length and breadth of the country introducing the DollyCrane to rental companies and potential clients to show them what they are missing! Or if you are in the London area, you could drop in and see us at Pinewood Studios. To organise your demo, or for any more information just get in touch! We are very pleased to announce that you are now able to view, demo and buy Floatcam DollyCrane equipment from PEC Video in London. In their modern showroom in Charlotte Street, W1 you can check out the unique capabilities of the DollyCrane, DollyCrane HD and Motion Control. 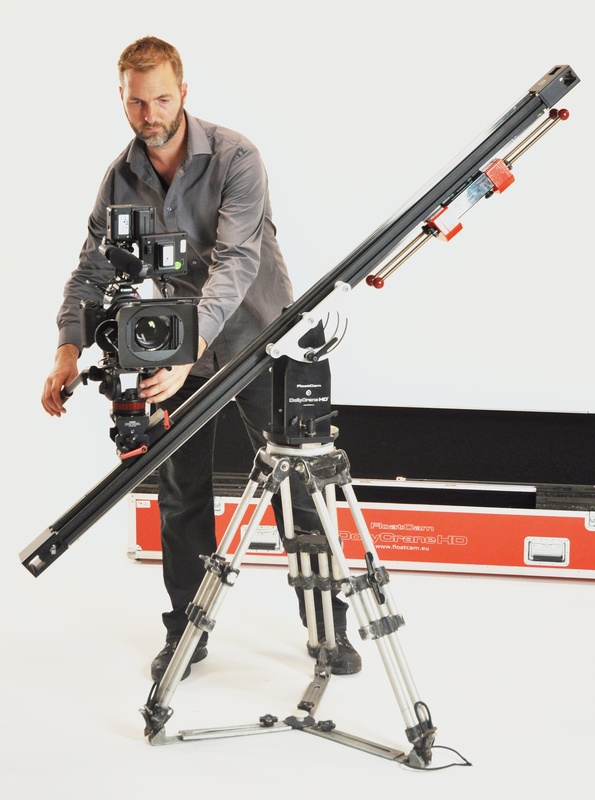 Panavision, VMI and Movietech take delivery of the Floatcam DollyCrane! We are very pleased to announce that Panavision UK, VMI and Movietech have all taken delivery of their first DollyCranes, adding them to their extensive grip hire fleets. All three of these rental companies were quick to see the potential of the DollyCrane, and are amongst the first UK customers! And now Shoot Blue have taken delivery of theirs too.